On September 5,2018, the Kanden SS-Scholarship Awarding Ceremony academic year 2018-2019 has taken place at B11 Hall. 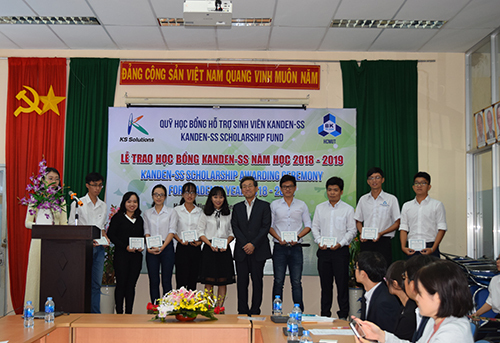 40 scholarships were handed over to excellent students of Ho Chi Minh City University of Technology by Kanden System Solutions Company, the member of Kansai Electric Power Company (KEPCO) – the second biggest power company in Japan. It’s our honor to have Mr. Yamamoto Yasuhiro – President and Director of Kanden System Solutions Company, and other Executive Board members also joining the ceremony to honor students who have excellent academic results and good qualities. 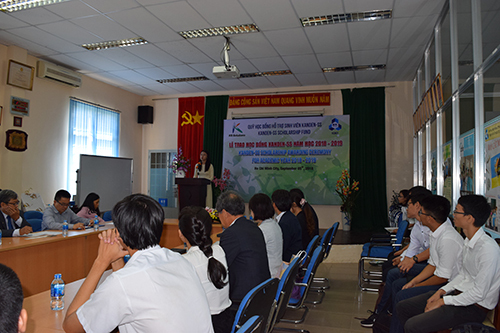 From HCMUT Prof. Tran Thien Phuc - Vice Rector, Board of rectors, deans of faculties, officers, lecturers and 40 students who received the scholarships attending the ceremony. 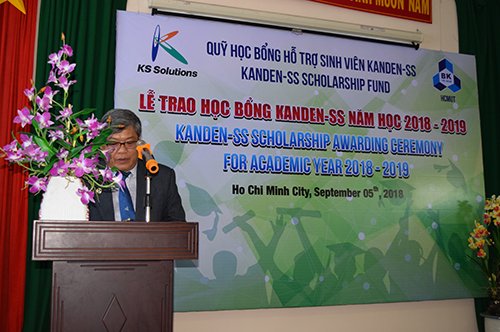 Established in 2012, Kanden SS scholarship aimed at encouraging the students’ academic and scientific research competence. 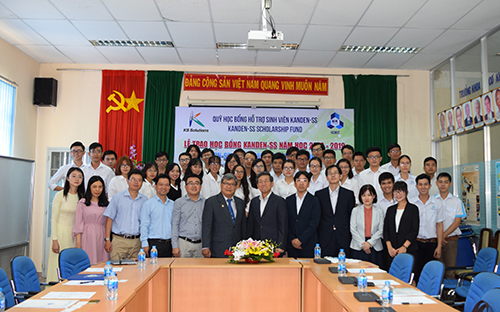 At the same time, the scholarship program also sets the objectives of promotion of human resource development, advancement of technology and cultural exchange activities between Vietnam and Japan. For the purposes, annually the Kanden System Solutions Company is committed to offering 40 scholarships to excellent students of the University with the total value of 2 million Japanese Yen. In 2nd year of 2nd phase of scholarship program and over the past seven years, 280 scholarships in total have been awarded to the students with the value of 50,000 Japanese Yen each. The scholarship program gives the students not only valuable financial aids, but also opportunities of job and internship at the company in the future. On behalf of scholarship recipients, the student Nguyen Gia Bao delivered the acknowledgment to the sponsor and the University. Mr. Norimasa Shoji from Kansai Electric Power Corporation (KEPCO), Japan continuing the ceremony with the seminar presentation about “Nuclear Power Plants” with topic is “Challenge of Kansai Electric Power”. Kanden System Solutions Co., Inc. provides information technology consulting services. The company offers data center solutions, infrastructure building solutions, system development solutions, consulting solutions, and operation and maintenance solutions. The company was founded in 1967 and is based in Osaka, Japan. Kanden System Solutions Co., Inc. operates as a subsidiary of The Kansai Electric Power Company, Incorporated.